… and I’m not talking about the hordes of people who flock to the beaches in their swimsuits and flip flops and matching towels. … arriving with hibachis and grills and coolers and tarps and tents and blankets and chairs and boom boxes. Like how far did they travel? How early did they need to arrive to get that prime shady spot and that prime parking spot? Do they come every day? Is there some kind of hierarchy among the various families? Fights about who gets what tree? Feuding among these Lakefront neighbors … complete with star-crossed teen lovers? … a giant summer-long picnic. 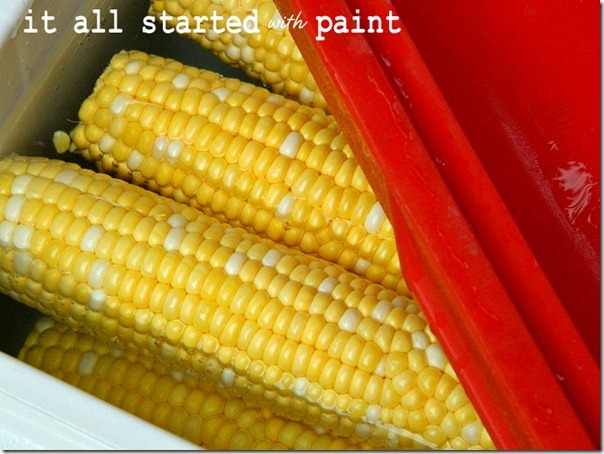 And as I sat on the beach lastweekend chatting with a friend while watching a woman swaying gently on a giant hammock tied between two trees, I first learned about cooler corn. And I don’t mean “my corn is cooler than your corn” cooler corn. … right on top of that shucked corn. And then they firmly shut the lid. And that’s where those ears of corn cook. I have never seen this…what a great idea! (Of course, my husband and I have only recently discovered microwaving corn-on-the-cob, so we are a little behind the times. Wow, I never heard of cooking corn in the cooler! Sounds like a good way to make it for a crowd. Pretty dang cool. A must try! The cook in me has questions though…how long do they leave it before they first eat it? Does it taste any different at the end of the day than when it is first put in? that is SO cool! or HOT! Very cool! I’ve never heard of doing corn that way! That is cool! Never heard of it, and I do have cool corn, so I’m gonna pin this to remind me how I can have even cooler corn. Brilliant! Must pin and remember!! that cooler corn IS in fact cooler than my corn. I’ve seen this all over Pinterest, but haven’t tried it yet. It seems too good to be true! OK…I have lived near the beach and had many a beach picnic all my life and have never heard of Cooler Corn…so much classier than wrapping it in foil and leaving it on the dashboard of the car!! !…Now just throw a couple of sticks of butter in the water and perfection!! Love it! Yes indeed, my grandmother would tell me that in the good old days in Chicago- they had no air conditioning- and on the REALLY hot days they would go down to SLEEP at the beach…but they didn’t bring any cooler corn. Gotta try that one! No way! I can’t believe it! Who would have ever thought! I have pinned this for future camping trips. Amazing. By the way – I love your porch makeover. That painted rug is extraordinary! PS I am your newest follower. Never, ever heard of this! I think this is just the greatest idea — you could boil the water at home and head out and enjoy your piping hot corn whenever you’re ready to picnic that day! Fantastic – thanks for sharing! This post speaks of SUMMER! Love it! And no, I’ve never heard of cooler corn, but that’s genius. ha ha ha! What a fantastic way to cook corn! There is always the coffee pot method! That is SO cool! We’ve wondered if there’s a lottery for those spots…one year on the 3rd for the fireworks, a family told us they had “staked their claim” two DAYS earlier!! While I don’t like being body to body at the beach, I do love me some good corn (as long as I’ve got my trusty dental floss at the ready)! Never heard of this – but what a great idea! Now I’ll be sporting bits of corn in my teeth as I catch some rays! NO NO NO! Don’t do it. Coolers have plastic made of BPA, which leeches into your food when it gets hot. This is SUCH a bad idea. BPA is nasty, nasty junk. Resist!! Whew. Sorry. I get a little bit crazy when it comes to BPA.